Both of my grandmothers were accomplished needle workers. Like many women of their generation, they were well versed in the “womanly” arts of sewing, embroidery and crochet. Also, being immigrants as well as living through the depression, both were hardworking, frugal women. A common symbol of their frugality was the button jar. Buttons seem to be a fact of life. They regularly pop off clothing so we are always looking for (or finding) a spare. Or when you are sewing, inevitably the button you like comes on a card of four and you need six buttons. It’s the sewing version of the hot dog/bun conundrum. Of course the only reason we have to buy them is because we can’t find six buttons that actually match in our button jar. And if you are a dedicated refashioner, you don’t throw anything away so unused buttons get added to the jar until your buttons runneth over. What do you do with all those buttons? This was the question that came to mind when I challenged myself to work only with materials I had on hand (note: constraints like this actually feed your creativity). When you think about it, in the craft world, there are really only three ways to use buttons (although there are unlimited permutations for each): as a fastener, as an embellishment or as jewelry. It was the jewelry aspect that got my creative juices flowing. While I dress conservatively, my jewelry speaks volumes about my style. My design aesthetic is heavily influenced by the arts and crafts of my childhood – granny squares, psychedelic prints, embroidery and chunky macramé plant hangers – in other words, lots of color and texture. I love the eclectic and the unusual and prefer bold and dramatic to dainty and demure. I dumped my buttons into one big pile and organized them by color and type (shank/no shank). I set aside the others and focused on the shank buttons – they were more interesting. Inspired, I grabbed some crochet cotton, a hook and the shank buttons and played around. Using a simple single crochet stitch and the buttons, I created a fun, eye-catching bracelet. The pattern is pretty simple. The whole bracelet is worked in single crochet over ten stitches, adding the buttons every other row. On the button row, add a button to every other stitch – about 5 buttons in a row. Continue in this manner until your bracelet is long enough to fit around your wrist. You could finish it off by crocheting a button loop (or two) on the last row and hook it over one of the buttons as a closure, but I chose to add a backing (I’ve used both leather and fabric) with a snap closure. I think the extra support is good. The hardest part of the whole project was hand stitching the backing to the bracelet. 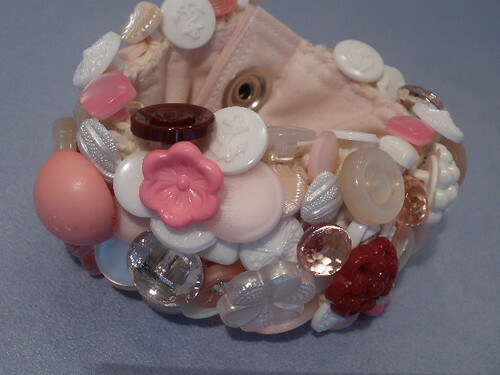 The best part – each bracelet uses about 100 buttons. You’d think that would put a dent in my button jar, but I’m beginning to suspect that they are like gray hairs, pluck one and 3 more show up in its place. Lynn Burdick is a designer, author and Kaizen Muse Creativity Coach who loves the thrill of the (thrift store) hunt. When she isn't playing with yarn/fabric or helping others follow their bliss, she can be found jogging, cooking, drawing, reading, dreaming of her own garden or plotting her next adventure. 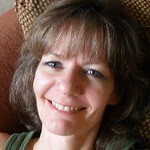 You can learn more about her at www.LynnBurdick.com.